A Best Seller! One of the most popular choices for weddings. Now with a Choice of ivory for the shirt. 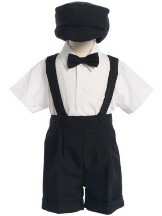 Dressy and comfortable ring bearer short 4-piece set in black which includes a cabbie hat, bow tie, cotton poly ivory short sleeve shirt and shorts with cuff and attached suspenders. 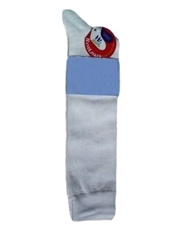 The material is a very good quality matte non-shiny polyester - and it doesn't wrinkle. See the Related Accessories to add some color punch to this little set. Note - This suit by Lito runs small as do many special occasion clothes. Order up a size from regular clothes. Check the General Size Chart for Knicker Sets, Shorts Sets and Eton Suits and choose carefully. Ships in 2 - 3 Business days.